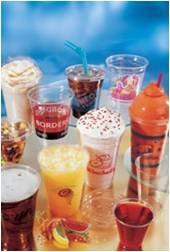 Insulated foam cups, maintain beverages at their optimal temperature longer. Not only do foam cups keep beverages at their proper serving temperature on the inside, they keep hands comfortable on the outside. Hot or cold, insulated foam delivers drinks the way they were meant to be. Ideal for coffee, cappuccino, tea, hot chocolate, hot cider, juice, and soft drinks. From high dome to straw slotted, insulating foam to SipThru, Mooney-General Paper Company supplies lids that not only complement every cup and container, but also every application you can devise. Raised sidewall rings increase strength and provide a secure gripping surface that’s easy to hold. Whether a weekend tailgate, or a weekday refreshment break, Conex translucent cups provide the flexibility to adapt to all of your plastic cup needs. These crack-resistant containers are the perfect way to package, transport, and serve all types of foods. One lid fits all container sizes. Plastic portion containers and lids provide the perfect portion for any purpose. Made of durable, crack-resistant polypropylene, they’re ideal for the many diverse dining and carryout applications in today’s foodservice market. For dining, these can serve anything from small side dishes to salad dressing and whipped butter. For carryout, when coupled with a secure fitting clear lid, they safely transport side sauces such as ranch dressing, marinara, salsa, and more. Convenience is the key with our foam hinged lid containers. Secure closure improves handling and helps protect against accidental openings. High insulation qualities make them ideal for transporting and storing both hot and cold foods. Carryout service wouldn’t be complete without them. Twelve popular sizes of our foam hinged lid containers feature a perforated hinge. This one-of-a-kind feature allows the container’s lid to easily be removed, making for a less cluttered dining experience and providing an extra plate for meal sharing. Foam hinged lid containers are available in both white and black.